I reached a clearing. I remembered walking through this clearing when I came up earlier. There were some man-made rock formations circling the edges on one side of the clearing. Walking past the rocks, I reached a large open space where I remembered seeing these plants. They were as tall as me, some even taller. They filled up most of the open spaces. I stopped and looked around me. Suddenly, I was not sure of my sense of direction anymore. Should I turn right or left? I followed one of the paths further to the right but it led me to a dead end. It was as if the tall plants had blocked the path midway. So I walked back and tried going the opposite direction. Another dead end. How could this be? I walked back to the centre of the open space. Behind me were the rock formations at the clearing I mentioned earlier. I stopped to think for a while. From which direction I climbed up just now? Somehow my brain wasn't working. I decided to just walk straight ahead. But as I followed the path surrounded by all those tall plants, I felt it was not the right direction. I quickly returned back to the starting position. The tall plants in front of me were beginning to overwhelm me. I realised I was lost! They were making my head spin. I suddenly felt lonely. Very lonely. I was all alone in the middle of this deserted mountain forest. Was it my imagination? Maybe it's just the wind. Who would know my name in such a place? Besides, it was my Mandarin name that was being called. No one ever calls me by my Mandarin name! My heart was beating faster by the minute. I was on the verge of panic. I have heard about spirits in the forests and I sure as hell did not want to encounter any such things in the middle of nowhere in China! Two hours earlier, I was having a nice time chit chatting with one of the counter staff at This Old Place Youth Hostel where I stayed. 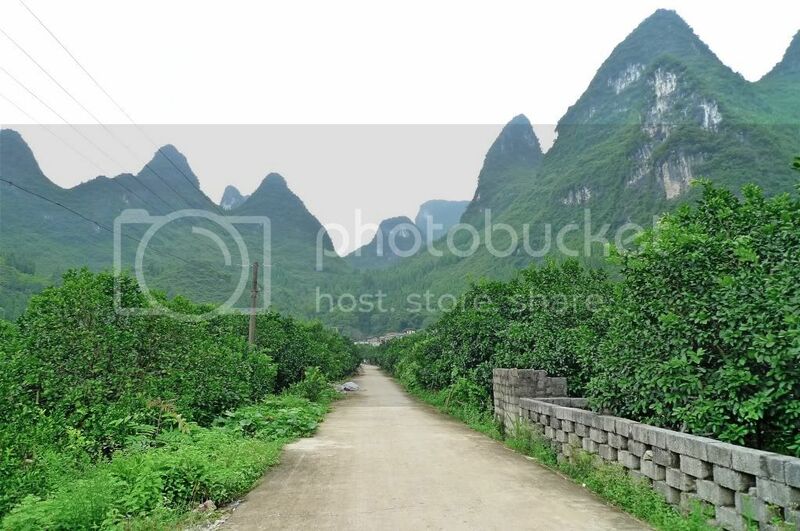 Before embarking on my solo trip to Xingping's fishing village, I had to make sure I know exactly how to get there. So I enquired at the lobby and I was glad the staff there spoke reasonably good English. There was one girl there who actually spoke excellent English and she showed me this map. 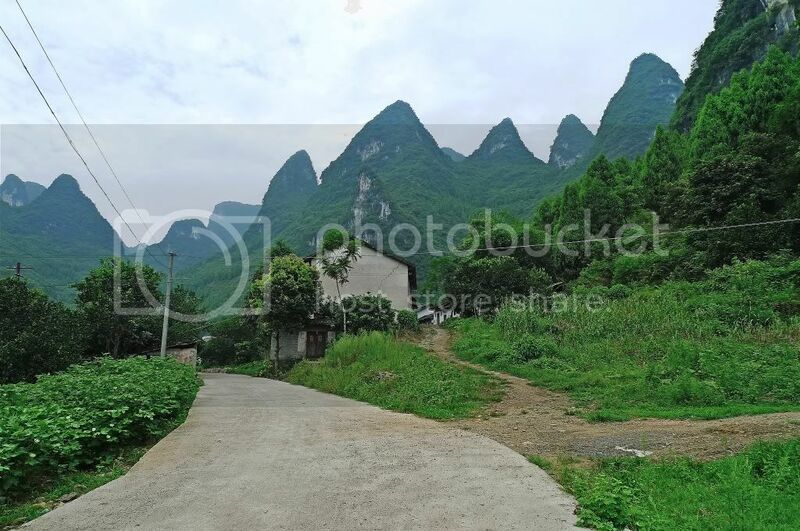 To reach the fishing village, I would need to hike up a mountain. 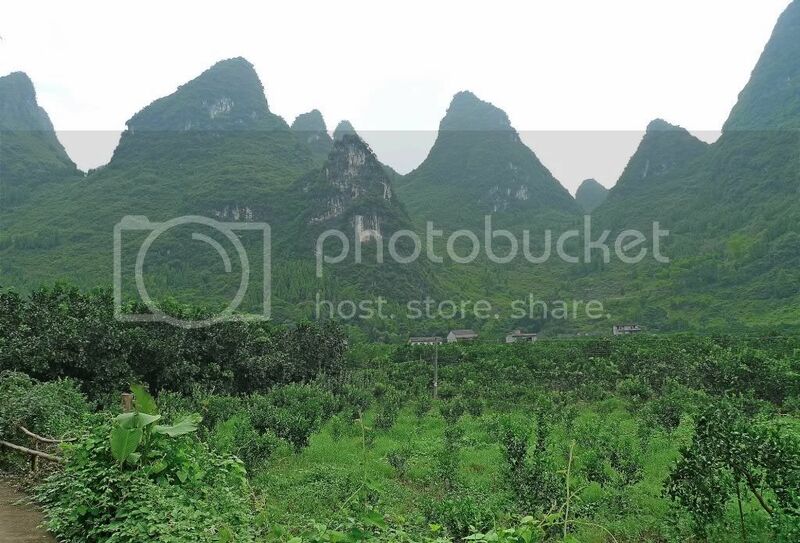 As you can see from the map, the fishing village is on the other side of the mountain facing the beautiful Li River. From my hostel, I would need to walk past the bus station (it's written as bus park on the map) on my left and then turn right into a village road. 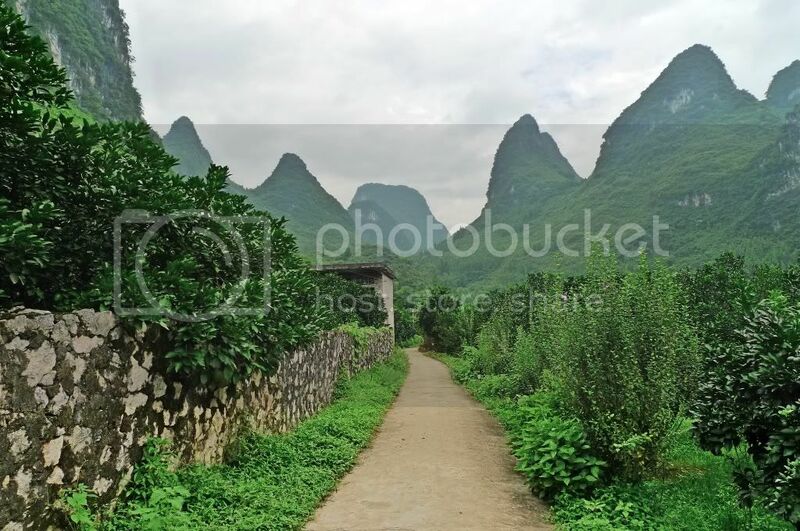 From there, I need to turn right into a hiking trail going up the mountain. According to her, if I come across any junction during my hiking, I must always turn right to prevent myself from getting lost. This should be a piece of cake......or so I thought! Before I left the hostel, I made sure I knew how to pronounce the word yú​ cūn​ which means fishing village in English. I had to make sure the locals there understand where I want to go if I ever need to ask them for directions! Looking at my handphone (I did not have a watch with me), it was already 2.30pm. I had better hurry. 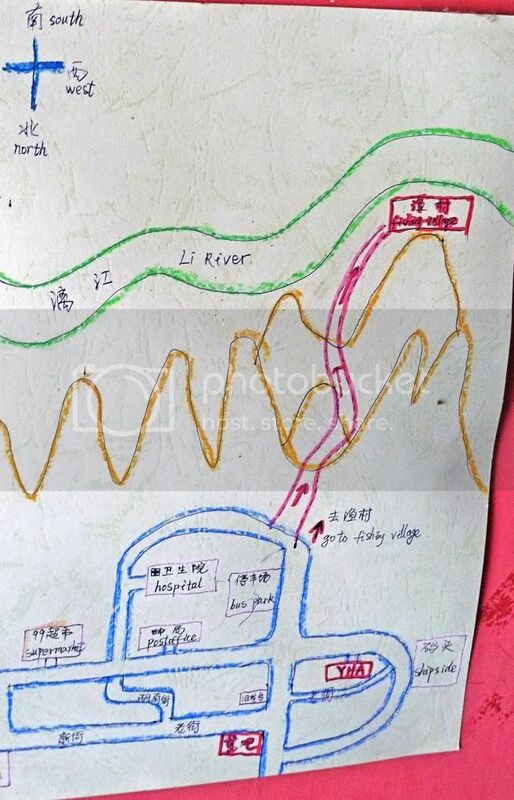 According to the girl, it would take at least one hour to reach the fishing village and that also depends on how fast I hike up and down the mountain! After passing the bus station, I was not exactly sure where the road leading to the village was so I asked a man manning a stall opposite the bus station. He pointed me to the right direction and asked if I was going alone. When I said yes, he sniggered. Now what's that supposed to mean? Anyway, I continued walking and reached this road. It was one long road and there was no right or left turn. I met a middle aged lady and asked her how to go to the fishing village. I did not understand her completely but I think she asked me to turn right when I reach the mountain trail. If the road I walked looks deserted, let me tell you it was indeed deserted. But the beautiful views of the green hills made the walk quite pleasant. Once in a while, I would pass by the local people there and I would just greet them with a "ni hao" or simply smiled. I wondered what building this is! Maybe it's one of those outdoor toilets so I was not too keen to find out! 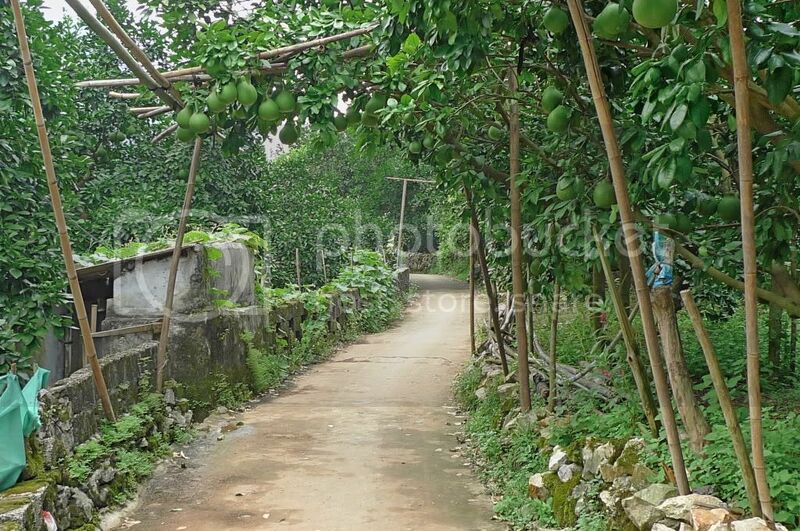 Further down the road, I saw some small farms and fruit plantation. Wonder what fruits these are? Pears? 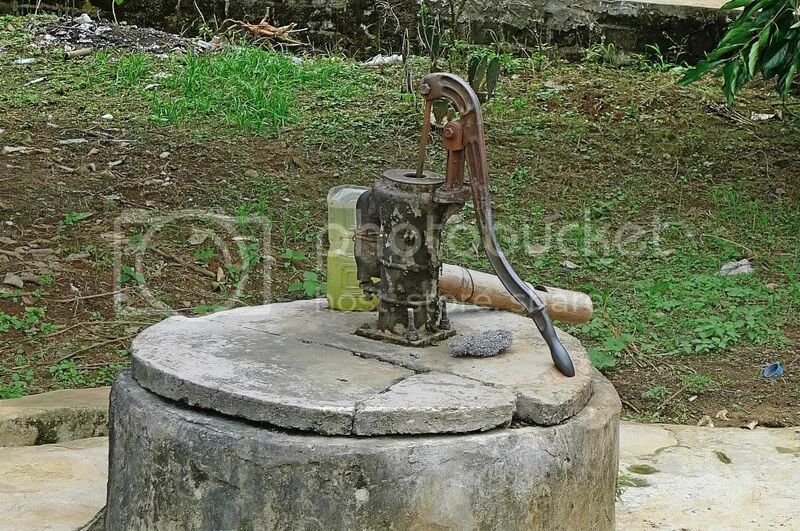 An old fashioned water pump! I guess the locals here still use this instead of modern taps! 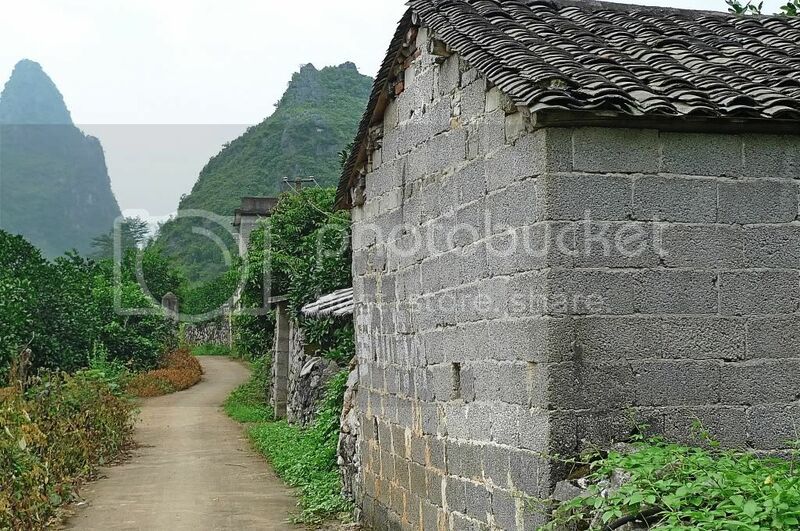 All along the village road, I tried to search for the mountain trail on my right side. There were actually a few right lanes. Which was the correct one? I actually tried all of them! But all of them did not lead me anywhere. One or two led me to a dead end. So I continued walking on the main road and reached here. This road led me back to the big main road where the bread shop I visited earlier was located! So I was back to square one! I decided to turn back and search for the mountain trail again. I could have missed it! I think I must have spent almost an hour walking up and down that village road! What a waste of time! Finally, I bumped into an old lady who was cleaning the compound outside her house. 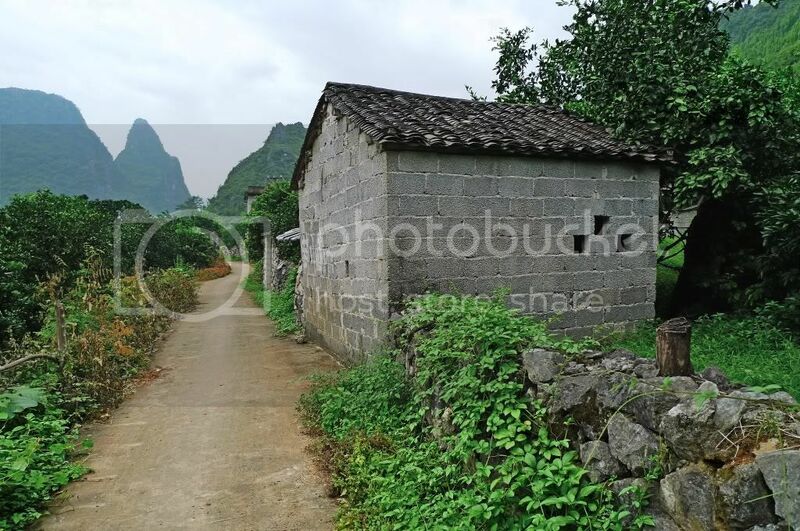 I asked her how to go to the fishing village and she immediately pointed to the lane next to her house. I wondered how I managed to miss that lane! Still, I really think they should put up a signboard or something! As I was about to enter the lane, I was stopped by the sound of bells ringing. What was that? Then right in front of me, they appeared. I was stunned! 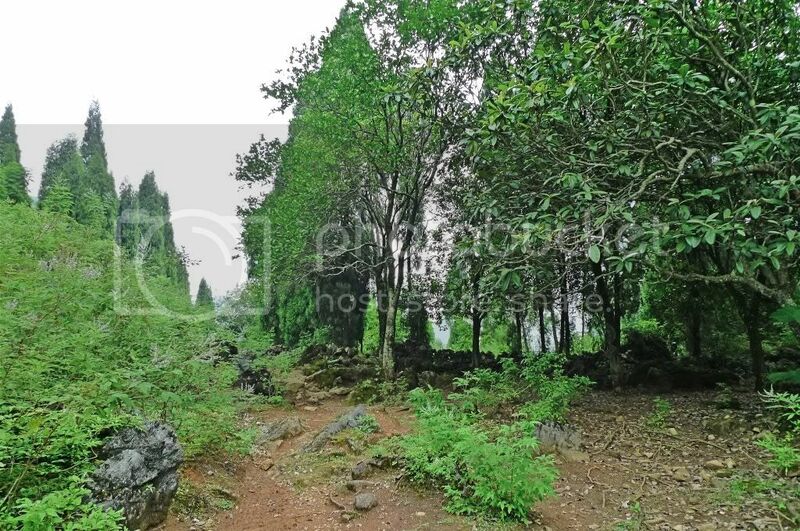 good morning Foong.. one thing i must say.. u r really adventurous.. walking and hiking up here and there in a strange new place never knowing any local guide .. i would not dare to do so.. cannot be a backpacker for sure! aiyo!!! please cont the story soon! i wanna hear! what did u see? some wedding band perhaps? or OMG someone dies and the priest chanted with the bell js like the old movie? haha, i think it's not those spirits lah, it's just yourself kept thinking of those things that scared yourself only..
but finally you are out of the jungle, you are not lost.. when i see the road, i know you were safe already..
At least they had the courtesy to add in colors! The greenery is beautiful! So peaceful and calm! Nice place to relax and maybe picnic! Was the wind cool? aiyar! You got lost! and keep missing the mountain trail! Oh even if they were to put up a sign to point the trail or fishing village, you won't know how to read what... it would be in chinese anyway! did you know, sometimes forest spirits are nice... they are there to lead you to safety. 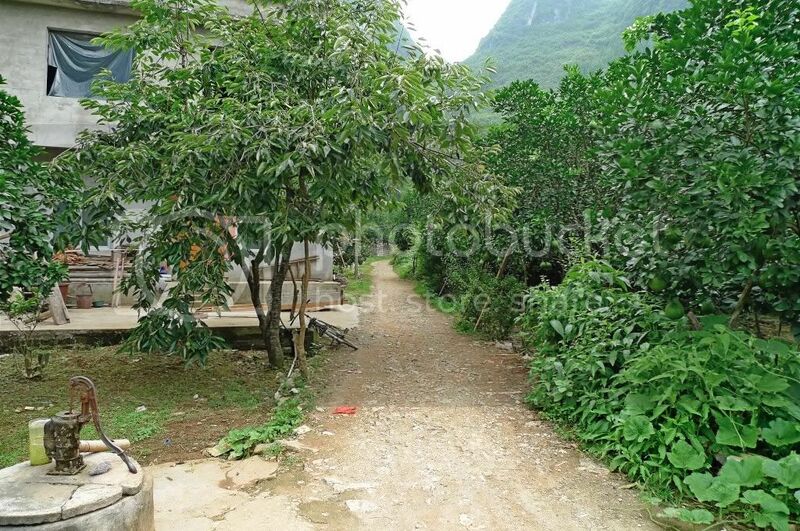 Lots of tiger prowling in the jungle in China.....next time must carry a gun when u go hiking there..ha ha ha! Your pictures and words took my accross the Pacific to China! "Staff" is plural - you do not need to add the "s" my friend. Ni Hau & Aloha, Friend! That would be a very scary moment for me. Being alone and lost. Omg! 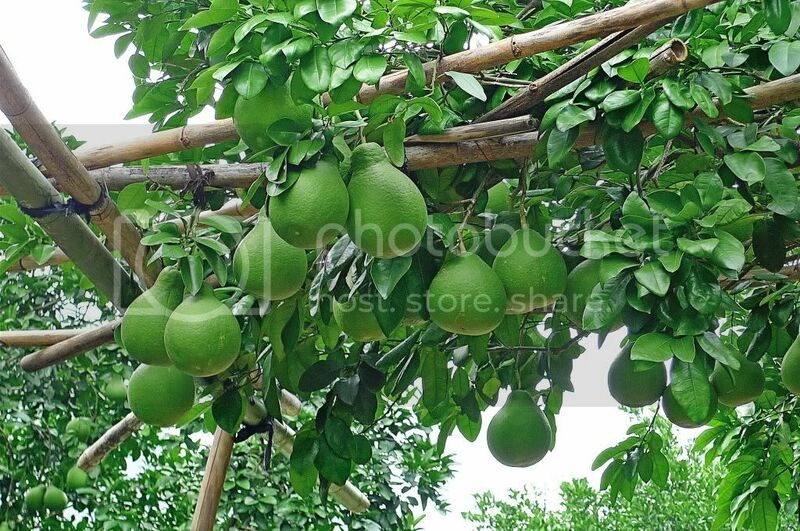 The fruits look like pomelos nearing ripeness. Why leave us hanging in suspense? (Lol) Okay, will be right back to know what those suspenseful sounds of bells are! Usually we when say "Saved by the Bell" is a relief by not in this case. Could it be hundreds of cyclists ringing the bells? Well well again gotta stretch our neck a little longer to wait for the answer. You are stunning good shall put the blame on you if we all have giraffe neck. Canto saying "wait until neck also long". Oh nice pixs again like the water pump. Thanks. Could it be pomelo or an orange tree? 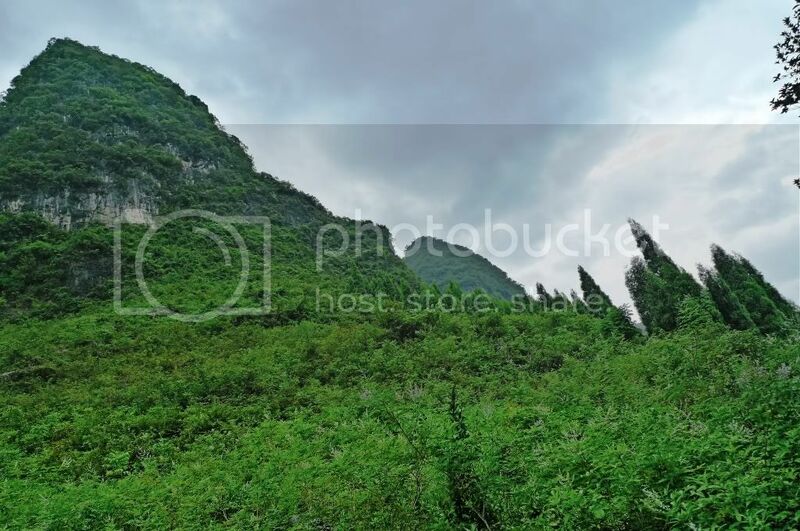 I like the photo where you were feeling dizzy and on the right you see the mountain view. Nice..
You're brave to go solo. But for guys it's all right. Better not to travel alone lest you get lost and can't find your way out and somemore with the language problem. wah this really looked like the scenes in the olden day movies! wah...reading your post make me feel suspense. I've heard that when one gets lost in the forest/jungle, take a pee break and you'll find your way. You didn't do that? hehe..
That hearing your name is scary. I have been told that when you hear your name being called, esp at night, DO NOT answer it but you can look towards the direction where that came from to see who's calling you. So, the answer to that part of the mystery is missing in your story. Or what you heard was indeed your name and they had launched a search party with bells and all..
Foong, I think you're adventurous to even venture out on your own with leg and toe injuries somemore. But frankly, it is not safe to venture out alone esp if one is a girl. I've received an email advising ladies not to do that in China as there have been kidnaps and eventually turning them into meat for consumption. Yucky! I know. There are pictures to substantiate that claim. Scary!! Nice fruits. Those can't be pears because they are too big for pears. Pomeloes are more like it. What about those orange fruits? Oranges? Looking at the narrow roads, there are no cars then? Yep! you're quite a story-teller now, with suspense and all - reminds me of those tv serials. haha..
Btw, we have lost count, what day of your trip is this? My mama loved this very famous story teller over the radio called "Lee Tai Soh" who each time at the kan cheong (suspense) part would say "this is it - tune next week same time same day..bla bla". Now next generation no more radio story but blogostory and presenting "Foong Tai Soh" -the story teller extraordinaire. Catch up with your ring-a-ding Part IV soon. Brought your handphone to China any idea what number to dail in case of emergency? I think you would as a frequent traveller. For the benefit of the rest this is a good link to note if you are travelling overseas. Thanks, Bananaz. That's useful info. Foong, a thought just came to mind. Did you buy travel insurance to be able to claim for your mishap? Despite being lost and panicky, you still manage to enjoy the scenery and take photos. Great job! Tell me who's "they" in your last sentence. Looking forward to Part 4! The pump! Haha :D So cute. But I think it is not very old fashion lar. Still ok. Although you had to be lost, I must say, the scenery was so so nice!! It pays to learn some survival skills. Wah so adventurous and scary!! I think I would have freaked out if that happened to me! Haha... awaiting for your next post!!! First time here, I was link to your Blog from Claire's. Just like what she said, I like the way your write the blog... interesting! How I wish I could join you on your adventure to find fishing village, my friend! Can I say that if I were not down with diarrhea, we should be able to locate the way to the fishing village? Because I can communicate with locals in mandarin, haha! Hi Ayie Oh you "connect" means see/feel only in forest or elsewhere as well? That's interesting! Heard a lot about forest stories before. Yeah I do but something that's scary at times most esp when there's so much going around you. You were walking alone with no one with you? I would certainly freak out if asked to walk alone in the bush. I have very very bad sense of directions. If I am in a new place, my husband always "kacau" me and says, are you lost? I don't know how some people have such good antenna. Honestly, I was a bit worried reading your story. hahaha! I am very interested in the fruit too, pear is it? It looks like pear a little yeah? I bet it tastes sweet and juicy! u are really cool..lost but still enjoy the scenery.. I'm back to drop EC Foong! Lazy day for me...now only starting day for real lol! they spoke english with you?! xin, haha, no, there was no wedding band and no one died! LOL! SK, really waited very long? ladyviral, child drawing? Haha! No, I think the map is drawn by an adult! 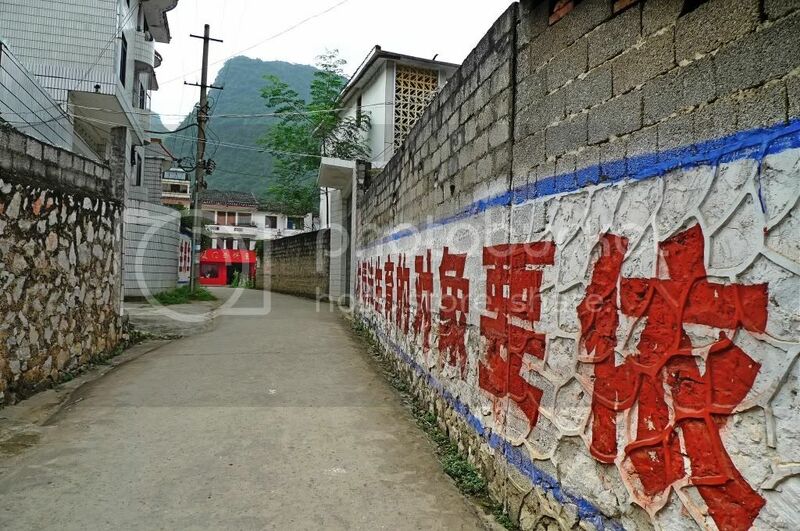 True, if they put up a signboard I would also not know how to read, but wait, I know how to read the character "yu" (meaning fish) as in "yu cun" (fishing village). pete, carry a gun? I thought must have license to own one, no? Or can buy a gun in China?! khengsiong, thanks! I'm just trying to make my post more interesting filled with suspense. LOL! cheahs@n, hundreds of cyclists ringing their bells? haha! Not likely as there's no room for so many cyclists on that narrow village road! kenwooi, if you are lucky, Part 4 will be the finale, but maybe I'll do Part 5. LOL! mei teng, oh I like that photo too! Haha! I actually captured that photo before I got lost. When I realised I got lost, I was in such a panic state, I didn't have time to think about taking photos! LOL! Wow, your post really make me suspense! Have a great trip, take care. Do drop by my blog when u r online. hei, the pic looked quite fake loh. Edited? You have too many comments until you can't reply all of them now! Aisay I can't spam you since you have got many spammers yourself. Just kidding! Faster update your post foong! What happened? What was the sound of bells? Argh... Frustrated to be in a suspense for so long! By the way, did you try to pluck out one of those green fruits to try out? Haha they look like pears to me, just greener in their colour. I wonder what it looks like inside. 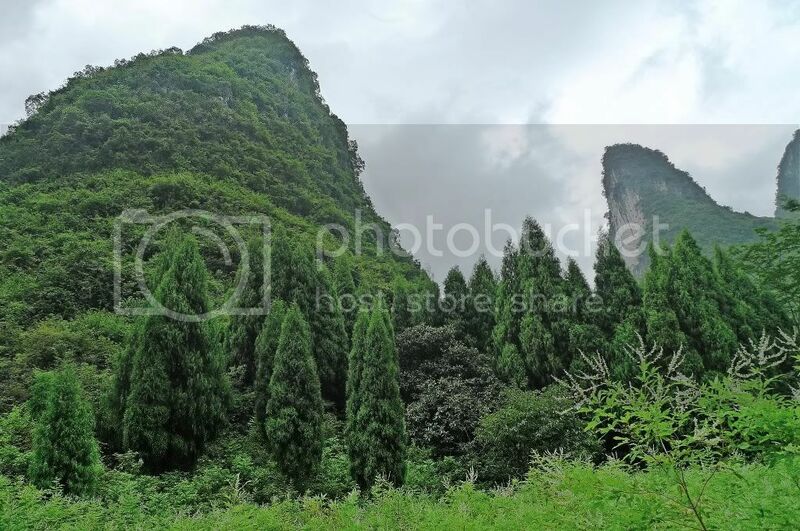 i can get lost in that very beautiful mountain forest, lovely images. This is soooooo beautiful, the mountains OMG! I'd love to get lost in there... Hahah! beautiful pics snd the pears look juicy. happysurfer, really? Can find my way by taking a pee break? I didn't know that! But I've been thought never to pee in the bushes just in case you offend some spirits dwelling there! Haha, I think whhat I heard was just my imagination! So you can still look at who is calling you without answering? I think I prefer not to look! LOL! I've seen those emails with the girls being kidnapped and cut up and became food for the poeple there, but I think they are not true, haha. Definitely no cars as the road is too narrow for cars. bananaz, foong tai soh? Haha! Actually, I really have no idea what number to call on my handphone for emergency. Is it 112? No the map was not drawn by her. It was already drawn earlier and was placed on the wall for everyone to refer to. You don't mind being lost in such a wonderful place? I don't think you will say that if you were there! Haha. gabriel, yes it's quite deserted actually! Not many people around at that time! ayie, if I can see or feel them like you, I think I also don't dare to go mountain trekking alone! Haha! It's quite difficult to retrace back my tracks from my digital shots as everywhere looks almost the same! 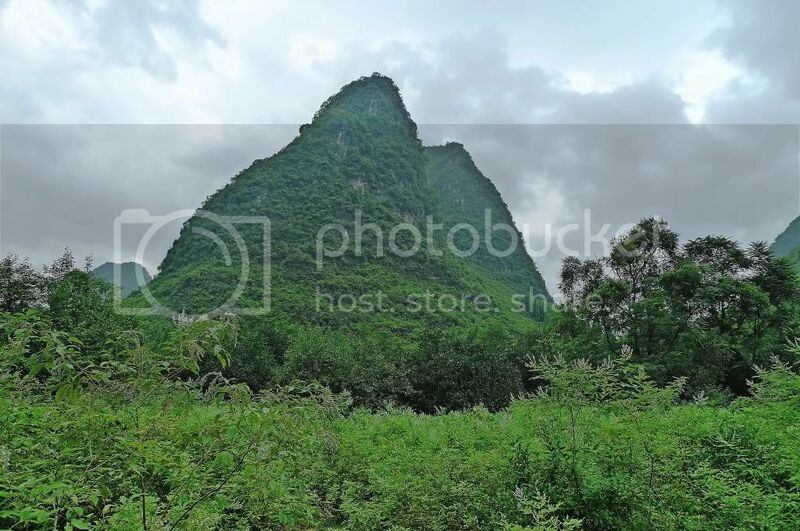 A mountain on my right may look similar to the one on my left! ai shiang, I do not have good sense of direction too! That's why must carry a compass with me next time. haha! mariuca, it does look like a pear to me! Haha! About the choc cake from PJ Hilton, still thinking about it. So very tempting! LOL! No I didn't pluck those fruits! I didn't want to get caught, you know I'm in a foreign land! How I communicate with the locals? Haha, it's like chicken and duck talk lah! I understood certain words and tried my best to piece a few words here and there to form a meaningful sentence. LOL! kyh, really or not? Wait till you get lost there then only you say so. Haha!